Sold by ALVABABY-AU and Fulfilled by Amazon. Gift-wrap available. Package included: 6 diaper + 12 inserts. Sold by ALVABABY-AU and ships from Amazon Fulfillment. Inner - Suede cloth: Suede cloth wicks moisture away from baby's bottom. 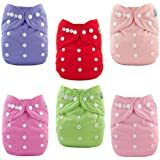 It is an excellent choice next to baby's skin for pocket style cloth diapers. Liquid passes right through suede cloth into the inner absorbent layers of the insert. Unlike fleece there is no pilling. Wash temperature: less than 86 Fahrenheit to avoid the PUL from delaminating. Please do not wash diapers together with your other clothes. You can add a little salt in the water when you wash diapers. Very happy with the quality of the product. First let me start by saying that I am new to cloth diapering. And have only recently starting using cloth diapers with my newborn. 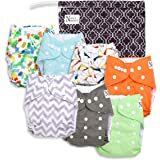 While I only have two other pocket style diaper brands, bumgenius and imagine, the Alva baby cloth diapers have already impressed me for its style, quality and price. Comparing the Alva to the much pricier bumgenius they are very similar. They both have a stay dry lining that looks and feels very alike and the outer printed waterproof lining also is very similar in feel and quality. Comparing them both side by side, the Alva is larger overall even with both set on the smallest rise. 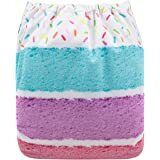 This makes for a slightly bulkier diaper especially on a newborn but I imagine that for a larger baby that won't be an issue. It might even be a better alternative for chunkier babies and still fit quite well into the potty training stage. Each diaper comes with two microfiber inserts. The insert is not quite as long as the bum genius regular size insert but looks and feels very similar, as well. Stuffing the diaper is a little more work than the bumgenius since the opening of the pocket is at the back end where the elastic is located. It takes a little more work to get the insert to lay just right. Overall, I am very pleased with the diaper so far. 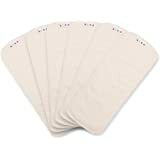 I'm hoping that the Alva diapers will be durable but so far I am please with the quality and style and for the price I can invest in a nice collection. The Alva seems to be a nice budget friendly alternative to BG. I will include pictures comparing the Alva to the Bumgenius side by side. Also the Alva insert in the picture is the one in between of the BG regular and newborn insert. And finally, how the Alva looks on a 4 week old 10 lbs. baby. 249 people found this helpful. 5.0 out of 5 starsLove these compared to other similarly priced brands! 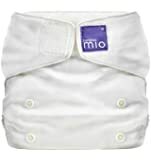 Inserts: I have a heavy wetter so I combine one bamboo diaper insert with one microfiber insert (the ones included) and I never have leaks with this brand as I do with other brands with the same insert combination. Cleaning: I use a 10 gallon bucket and mix several large splashes of cleaning vinegar with 4/5ths bucket full of water for the diapers to soak in prior to washing. I have never had a stain nor a smell with my diapers. To dry the diapers I hang them on a clothes line. I have had them for a while and the integrity of the diapers are still good as new with these cleaning methods. Outside clasps: I like that you can clasp the diaper together like you would a disposable diaper once it is dirty which makes taking these out in public a lot easier. 5.0 out of 5 starsThe absolute best!!!! We love these so much! We honestly have no complaints. They never leak. They are so easy to use and to care for. They are nice and trim. They are a great price!!! (You can find sets of 6 for as cheap as $30!!! That's $5 a diaper! I've purchased two sets!) I'm so pleased. Best diaper out all the diapers we've tried-mama koalas(pocket), bumworks(pocket), bumgenus(pocket) and thirsties(Aio) by far! We've started using prefolds and covers only at night (because we didn't have enough Alvas to get us through night and day) but I just purchased a handful more Alvas! I have a feeling I'll rarely use anything else! I have included a picture of how they look under a onesie to show how trim they are! After few months using cloth diapers I'm ready to make a review. 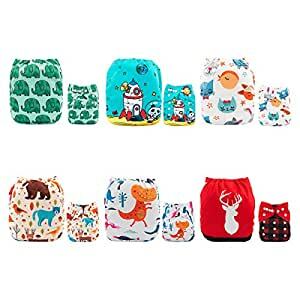 I bought ALVA pockets, Nora nursery pockets, BumGenius pockets, Flip cover and All in One Ecoable. I have been using them for 3 months now. Alva and Nora have the same shape are very very similar the only difference between them is the insert. Alva come with 2 microfiber inserts and Nora one bamboo/ microfiber. In my opinion, I prefer the organic fabrics like bamboo, hemp and cotton because they hold more pee, but they absorb pee slow when compared to microfiber. Microfiber inserts soak pee pretty fast, but you can have issues with compression leaks. 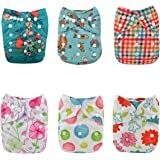 The advantage of using pocket is you can use another insert or try different things like prefolds, flats, birdseye or flour sack towels that works best for you and your baby. Now I use inserts that are hemp and bamboo that I sewed myself. BumGenius pocket and Flip covers they look very similar in shape but one is a pocket and the other is a cover, lol. They are very well make and the BumGenius come with 2 microfiber inserts, one big with snaps that you can regulate the size and one small. The flip cover has a microfiber insert and a top layer of cotton (not sure) that you can fold to adjust to the size of your baby (you can't put microfiber against the baby skin). I heard some complaints about the elastics becoming relaxed in the BumGenius diapers, but I didn't have issues with it. Because I know how to sew I checked the diaper to see if I could replace it myself in case it turns relaxed, and it looks like it's pretty easy to replace. I don't even need a sewing machine to fix it if I need. The advantage of the covers is to be able to use it more than one time, you just have to change the insert if the cover is not dirty. Also, I don't have to spend time stuffing pocket diapers. Also, if you want to go minimalist, covers are the best option. I wish I thought about it before buying all my diapers lol, now I have too many. All in one Ecoable is pretty and very well made. I don't have to stuff the diaper because the insert is attached to the diaper. Also, it looks like a pocket you can put more inserts if needed. It has a double gusset and it's pretty good to avoid leaks but if you have a chubby baby it might not work. My baby has big thighs and it makes marks on his legs. He is 4 months old now and I can't use it on him anymore :-(. I like the charcoal bamboo pocket because it absorbs pee well and I don't see stains easily. According my last pic you can see how bulk they are when compared to each other; the Flip cover is the smallest one and BumGenius is the biggest one. I love the way Alva and Nora nursery fits and like the BumGenius and Flip cover fit too. But Alva and Nora are my favorite pocket diapers. Unfortunately, I don't like the fit of the Ecoable but it must be because I have a chubby baby. I love ALVA they are my favorite and the price is very good too! I hope this review help you! I am new to the cloth game. My first was in disposables and my second was in disposables up until now. With our 3rd coming, we were looking for ways to save money, so we finally caved. We started with prefolds, but my baby wasn't a fan of my cold hands trying to navigate a pin. I finally bought a pack of Alva since I heard they were the most budget friendly. I am seriously in love. The inserts bulked up after only one prewash. They fit my daughter who is almost 2, but fitting into 3T clothes, with room to spare. I doubled up the inserts and they lasted over night with 0 leaks (8:30pm to 8:30 am). The morning diaper had a poo and it washed right off with no residue. We will definitely be buying way more.